More than 70 percent of pollen and honey samples collected from foraging bees in Massachusetts contain at least one neonicotinoid, a class of pesticide that has been implicated in Colony Collapse Disorder (CCD), in which adult bees abandon their hives during winter, according to a new study from Harvard T.H. Chan School of Public Health. 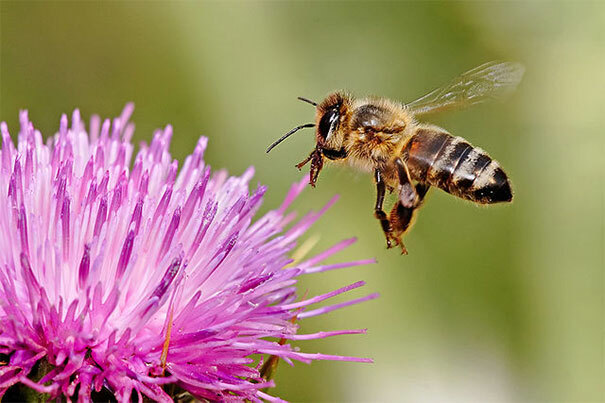 Since 2006, there have been significant losses of honeybee colonies. Scientists, policymakers, farmers, and beekeepers are concerned with this problem because bees are prime pollinators of roughly one-third of all crops worldwide. Previous studies analyzed either stored pollen collected from hives or pollen samples collected from bees at a single point in time. In this study, the Harvard Chan School researchers looked at pollen samples collected over time — during spring and summer months when bees forage — from the same set of hives across Massachusetts. Collecting samples in this way enabled the researchers to determine variations in levels of eight neonicotinoids, and to identify high-risk locations or months for neonicotinoid exposure for bees. The researchers worked with 62 Massachusetts beekeepers who volunteered to collect monthly samples of pollen and honey from foraging bees, from April through August 2013, using pollen traps on the landings of beehives. The beekeepers then sent the samples to the researchers. The researchers analyzed 219 pollen and 53 honey samples from 62 hives, from 10 out of 14 counties in Massachusetts. They found neonicotinoids in pollen and honey for each month collected, in each location — suggesting that bees are at risk of neonicotinoid exposure any time they are foraging anywhere in Massachusetts. The new findings suggest that neonicotinoids are being used throughout Massachusetts. Not only do these pesticides pose a significant risk for the survival of honeybees, but they also may pose health risks for people inhaling neonicotinoid-contaminated pollen, Lu said. “The data presented in this study should serve as a basis for public policy that aims to reduce neonicotinoid exposure,” he said.